Download "Welcome to the ProQuest online orientation. 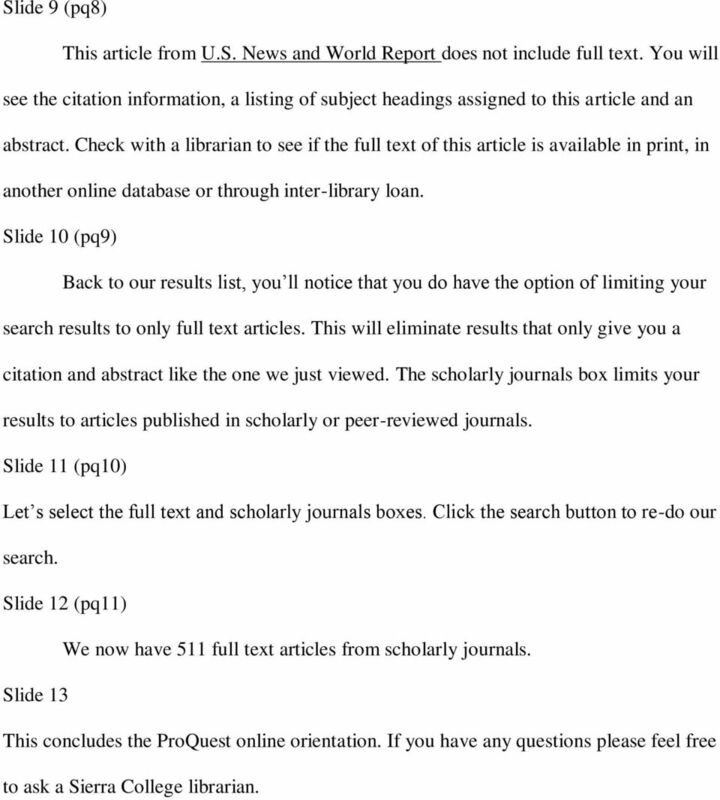 ProQuest is an online index to"
1 Slide 1 Welcome to the ProQuest online orientation. ProQuest is an online index to magazine, journal and newspaper articles and it provides access to 23 online databases in the areas of business, social science, health, education, science, humanities, psychology, religion and current events. Full text articles, which are articles reproduced in their entirety, are included for many publications. During this orientation, you will learn how to search ProQuest using the basic search. You can pause the tutorial at any time by using the controls at the bottom of the slide. You can zoom in on a slide by placing your cursor over the area you d like to view and clicking your mouse. Clicking again will zoom out. Slide 2 (pq1) You can connect to ProQuest through the library home page at You can select one of the quick links under Find Articles or you can select research databases to see a complete list. If you are connecting from an off-campus computer, you will be prompted to log in with your MySierra username and your student ID number as the password. 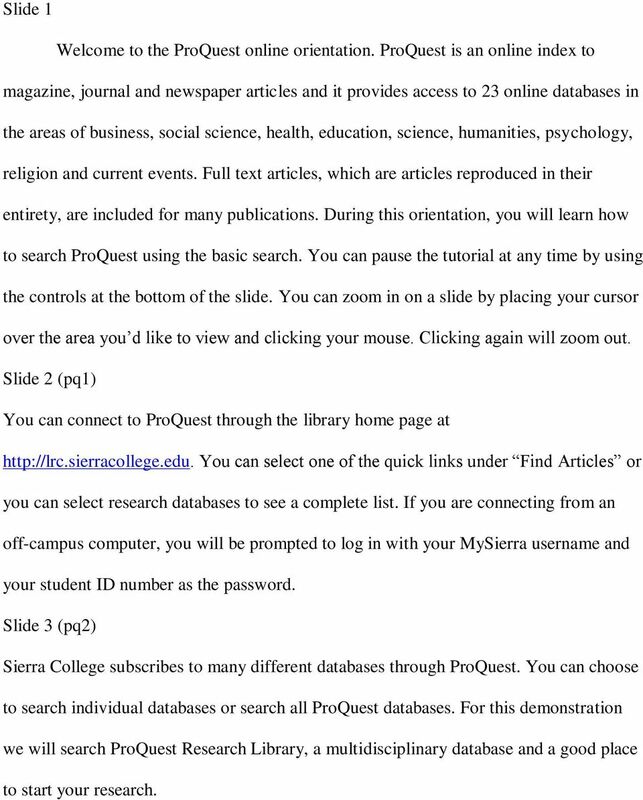 Slide 3 (pq2) Sierra College subscribes to many different databases through ProQuest. You can choose to search individual databases or search all ProQuest databases. For this demonstration we will search ProQuest Research Library, a multidisciplinary database and a good place to start your research. 2 1 Slide 4 (pq3) This is the ProQuest Basic Search screen. Type your topic in the search box. Let s search for articles on the effects of global warming on glaciers in Alaska. 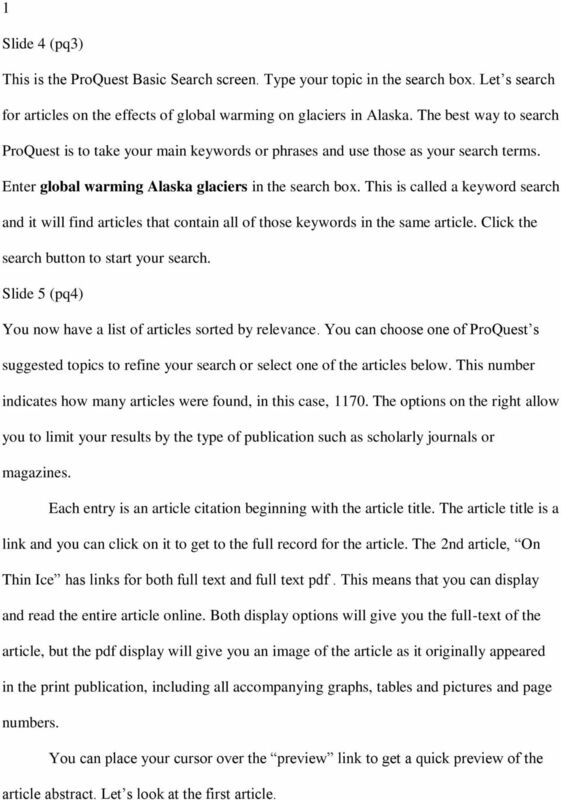 The best way to search ProQuest is to take your main keywords or phrases and use those as your search terms. Enter global warming Alaska glaciers in the search box. This is called a keyword search and it will find articles that contain all of those keywords in the same article. Click the search button to start your search. Slide 5 (pq4) You now have a list of articles sorted by relevance. You can choose one of ProQuest s suggested topics to refine your search or select one of the articles below. This number indicates how many articles were found, in this case, The options on the right allow you to limit your results by the type of publication such as scholarly journals or magazines. Each entry is an article citation beginning with the article title. The article title is a link and you can click on it to get to the full record for the article. The 2nd article, On Thin Ice has links for both full text and full text pdf. This means that you can display and read the entire article online. Both display options will give you the full-text of the article, but the pdf display will give you an image of the article as it originally appeared in the print publication, including all accompanying graphs, tables and pictures and page numbers. You can place your cursor over the preview link to get a quick preview of the article abstract. Let s look at the first article. 3 Slide 6 (pq5) This is the record for the article Baked Alaska. The display starts out with the citation for the article including the article title, author, publication title, date and page numbers. This article appeared in Smithsonian magazine and was published in the August 2005 issue. Farther down you will find an abstract, which is a brief summary of what the article is about. Below that you will find the text of the article. Back to the top of the screen, you have the option to print or the article. You also have the option to cite the articles for a bibliography. Always compare their citation example with the appropriate style guide such as the MLA Handbook or the APA Handbook to make sure the format is correct. Slide 7 (pq6) You can save articles by checking the box next to add to selected items. Mark the article by clicking the box next to mark document. This will save your articles during your current research session. If you want your saved articles to be accessible online during future sessions, click save to my research and follow the instructions for creating a My Research account with ProQuest. You can click on back to results to get back to the list of articles. Slide 8 (pq7) Now we re back to the results list. Notice that you can also limit the date range of your articles by sliding the date bar to the date range you want and clicking the update button. Let s take a look at Defrosting the Past. 4 Slide 9 (pq8) This article from U.S. News and World Report does not include full text. You will see the citation information, a listing of subject headings assigned to this article and an abstract. Check with a librarian to see if the full text of this article is available in print, in another online database or through inter-library loan. Slide 10 (pq9) Back to our results list, you ll notice that you do have the option of limiting your search results to only full text articles. This will eliminate results that only give you a citation and abstract like the one we just viewed. The scholarly journals box limits your results to articles published in scholarly or peer-reviewed journals. 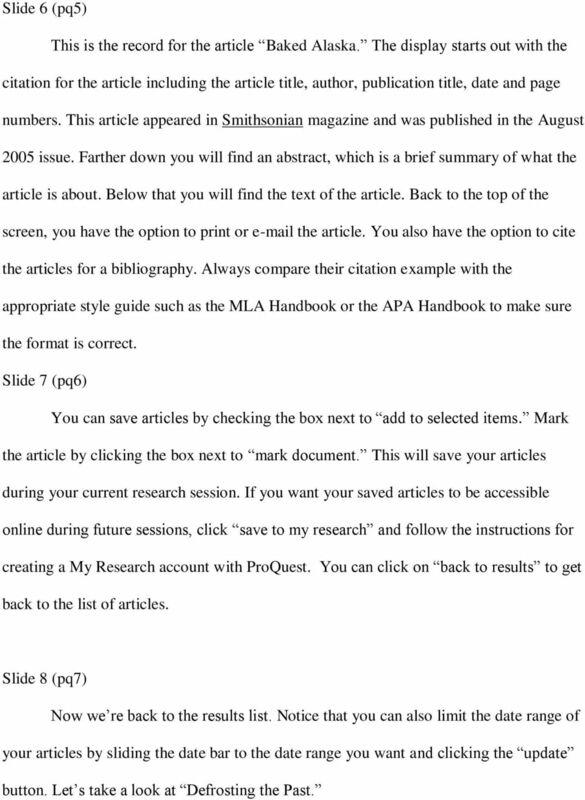 Slide 11 (pq10) Let s select the full text and scholarly journals boxes. Click the search button to re-do our search. Slide 12 (pq11) We now have 511 full text articles from scholarly journals. Slide 13 This concludes the ProQuest online orientation. If you have any questions please feel free to ask a Sierra College librarian. What is SIRS Researcher and what can it do for you? An Introduction to Using CINAHL Through EBSCOhost What is CINAHL? CINAHL stands for the Cumulative Index of Nursing and Allied Health Literature and is the largest and most in-depth nursing research database. General Options Name of this search preference Search preference description Do you want to make this the default preference for all locations? Welcome Page Options Do you want to display a welcome page? Zotero. Zotero works best with Firefox, but Google Chrome and Safari may be used standalone. Zotero 1. Install Zotero works best with Firefox, but Google Chrome and Safari may be used standalone. If you need to download Mozilla go to http://www.mozilla.org/en-us/firefox/new/ and follow the prompts. I. DATABASES: Book and journal databases provide access to information. EMERALD. Access Emerald from Athens and log in using the logins you have been allocated. SCOPUS Scopus is a database which offers a comprehensive overview of international research in the fields of science, technology, medicine, social sciences, and to a lesser extent, the arts and humanities. www.universitypressscholarship.com Oxford University Press 2011. All rights reserved. Table of contents. Tutorial Home Page. What is University Press Scholarship Online?. Navigating from the Home Page 4. Browsing by subject 5. Working with Subject Specializations in the Quick Search 6. A. What are Online Databases? Help with Primo. How do I..
How to Search Randwick City Library Services Online Databases. Need More Help? Online Tutorial 1 RefWorks User Q u i c k S t a r t G u i d e Version 4.0 Logging In Institution-Wide Subscribers Access / r e f w o r k s and then enter your personal Login Name and Password. Go to Click Library to open the Library s Web site. 1. What is Web of Science p.1. 2. Accessing Web of Science (on and off-campus) p.2. 3. Search tips p.3. 4. Results display and filtering results p.
General Guide THE LIBRARY www.salford.ac.uk/library Finding Theses Finding Salford theses in the Library The Library receives a copy of every higher degree thesis accepted by the University of Salford.